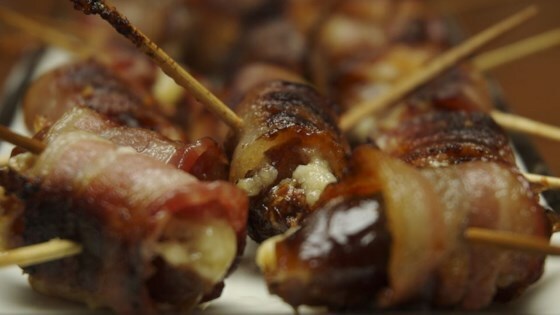 "Dates are stuffed with blue cheese, wrapped in bacon and baked until crisp. These are delicious and very easy to make for a party. You can serve them at room temperature, so it is okay to make a few hours in advance!" Slice dates in half, and open them up. Pinch off pieces of blue cheese, and place them into the center of the dates. Close the halves of the dates, and wrap a half-slice of bacon around the outside. Secure each one with a toothpick. Arrange in a baking dish or on a baking sheet with sides to catch any grease. Bake for 30 to 40 minutes in the preheated oven, or until the bacon is crisp. Turn dates over after the first 20 minutes for even cooking. I stuffed the dates with smoked almonds and blue cheese, then drizzled a red wine reduction over them just before serving. Sooooo yummy! !